A récits is a short story or anecdote; récits are often told to amuse, entertain, warn, intrigue, or in other ways impart knowledge and experience. Stories should be about time spent conducting multimodal fieldwork and/or experimenting with multimodal representations of fieldwork. They can be written in any genre and consist of any media. Contributions should be a maximum of 2000 words. Pictures are the equivalent of 200 words each. Video and audio submissions for this section should be no more than 7 minutes long. 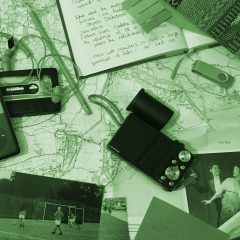 Experiments and experiences in carrying out multimodal ethnography. The section aims to provide a platform in which researchers could discuss practical experiences of applying multimodal approaches and methodologies in the research, data collection or analysis. Entries in this section should aim to make contributions towards methodological and analytical applications, experiments and innovations in multimodal research, which might help towards expanding and reflect on the field. They can be written in any genre and consist of any media. Contributions should be a maximum of 6000 words. Pictures are the equivalent of 200 words each. Video submissions for this section should be no more than 30 minutes long; audio submissions should aim for a maximum of 15 minutes. Reviews of books, films, performances, music past and present that speak to multimodal ethnography, support the development of multimodal languages and they could address ethnography, directly or indirectly. Maximum of 1000 words with an additional maximum of five pictures. Please submit the main text in word processing format, such as.doc, .docx, .odt, .txt. Please indicate where media (images, videos, audios) should come in the text. Please send the media separately either as attachments, as a .zip or .rar file or (especially for larger files) create a GDrive folder with your files and share the folder with us (entanglementseditors@gmail.com) or alternatively send us the files via dropbox, wetransfer or similar platforms. Specifically for videos, you may also upload those in a personal vimeo account and share the link(s) with us. Audio: please use .mp3 format files. Pictures: please use .jpeg or .tiff files. Please title and give a number under every embedded image and video file; please make sure that media files titles correspond to the directions in the text. Please use Harvard citation style. Marks, L. (2002). Touch: Sensuous Theory and Multisensory Media. Minnesota, Minnesota University Press. Bartos, A. E (2013). Children sensing place. Emotion, Space and Society, 9, pp. 1-98. In text citation (Surname, Year) and (Surname, Year, p. no).